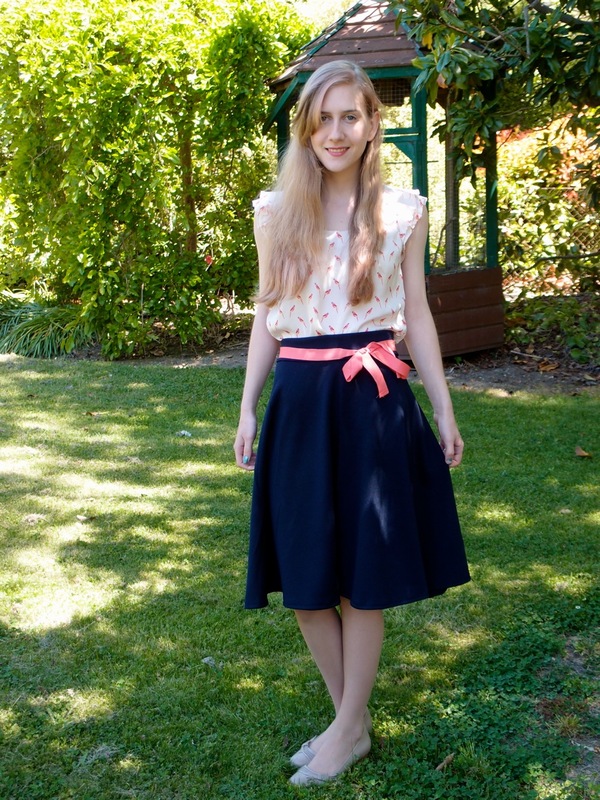 Yesterday I made myself a half-circle skirt, and I am in love with it! It's surely the best thing I've made! It's much more wearable than a full circle skirt, and it falls beautifully. The photos I too don't do it justice. The Best. I took inspiration from Four Square Walls (which is my new favourite blog), and watched a couple of youtube tutorials. 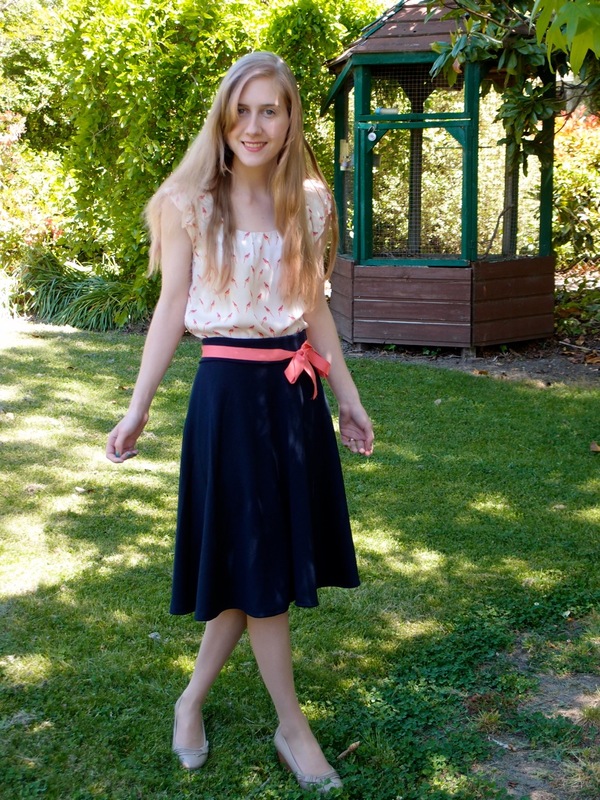 It's a very easy skirt to make! Even You can do it! First you need to do a little maths. 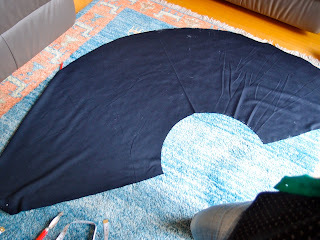 Since this is a half circle skirt and not a full circle skirt, you need to double your waist measurements so that the half-circle radius is your actual waist measurements. 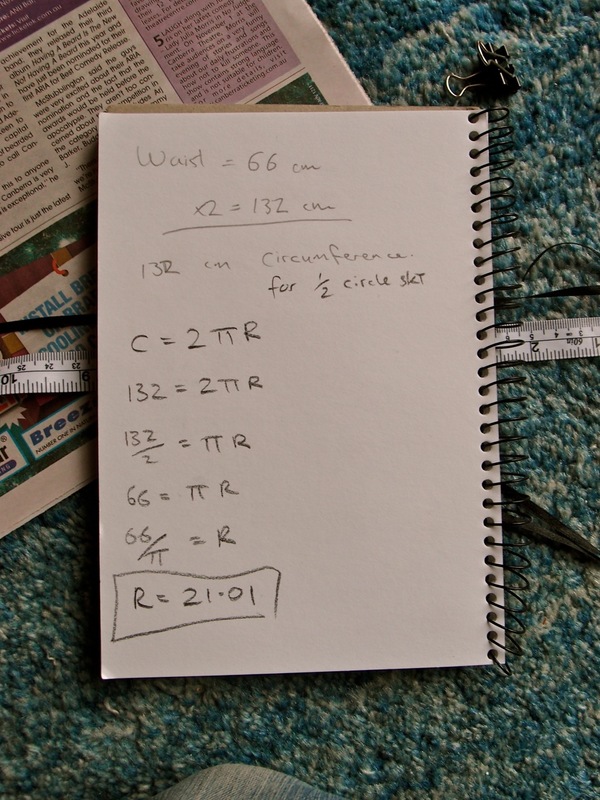 Circumference = 2 * Pi * R (we're after R, the radius). 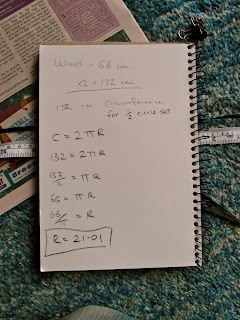 Circumference = 2 * waist measurement, so for me 66 * 2 = 132. 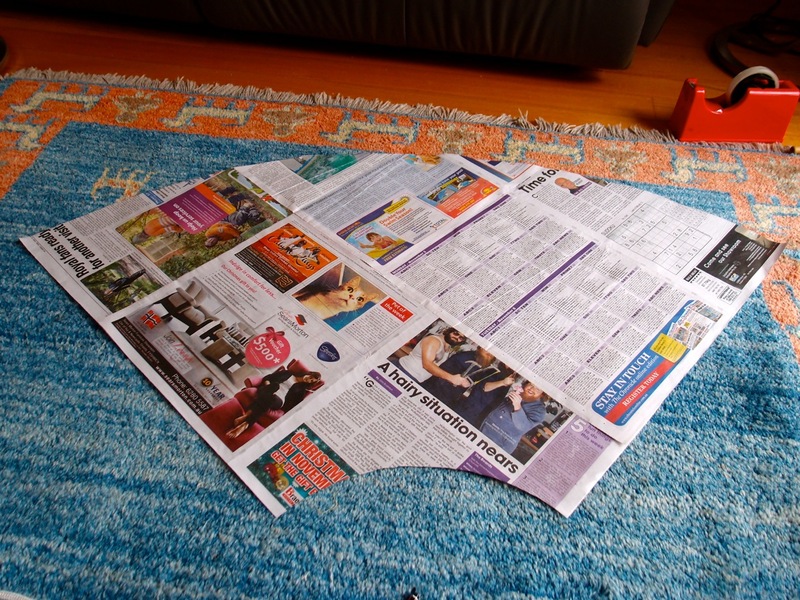 You'll need a big piece of paper (I stuck some newspaper together) with a right-angle corner. Most (all) newspapers or whatever are right angled rectangles. 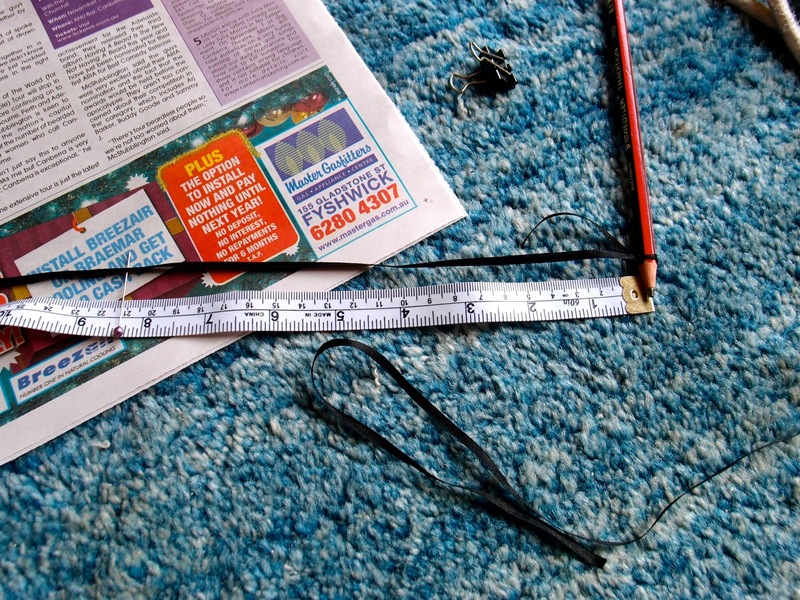 So to draw the pattern, tie a pencil to a bit of string and measure out your radius (mine being 21cm). Put a pin in the string at that point, and stick it in the carpet. Put your right-angle corner at the pinpoint. Now draw your radius arc on the paper. This is one half of your WAIST measurement. Now decide how long you want your skirt. 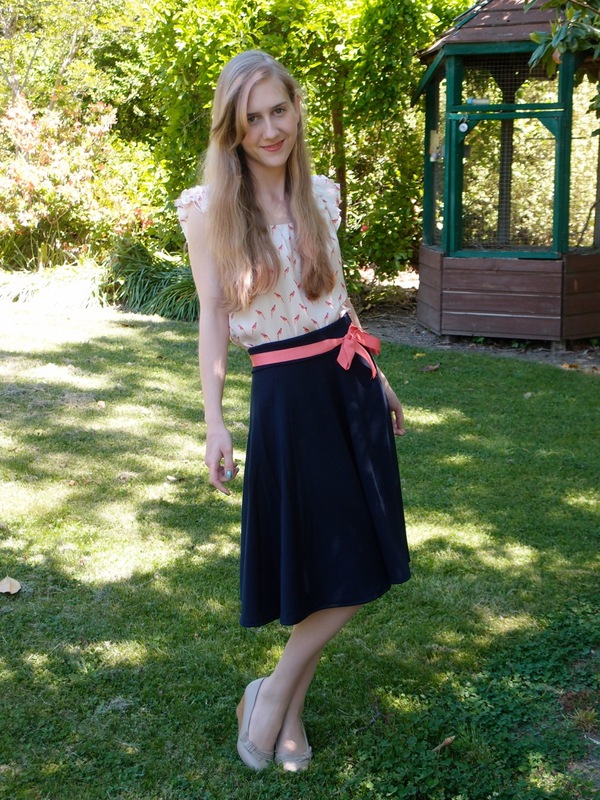 Just hold a measuring tape to your waist and measure to where you want the skirt to end. I wanted mine 62cm from my waist. Remember to add a little seam allowance. Now add that measurement to your Radius measurement. So mine was 62 + 21 = 83. Put a pin in the ribbon at that measurement and draw an arc on the paper the same as before. Cut it all out. It should look like this. Please note that this is a quarter of a circle, as we will cut on a fold for the full half circle. Lay out your pattern on your fabric. In my case, the fabric is folded in half with the fold at the bottom of the picture. Pin and cut. You should end up with this. Did you? Yay! Hold it up to your waist and gad about the house. Now for the waistband. If your fabric is stretchy, cut a rectangle exactly the length of your waist (don't worry about seam allowance). This way it will hug your waist nicely and won't fall down. If your fabric is non-stretch, you'll have to give a few cm seam allowance. You don't want to be cut in half. 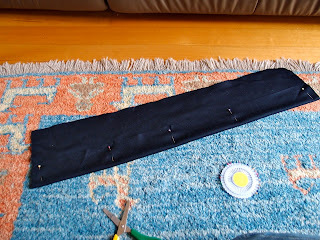 You can make the waistband as wide as you choose, mine is around 5cm. 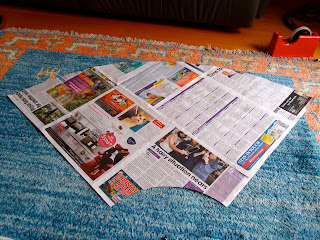 Just cut a rectangle with your waist measurement as the length, and your waistband width x 2, plus 4cm turnover. 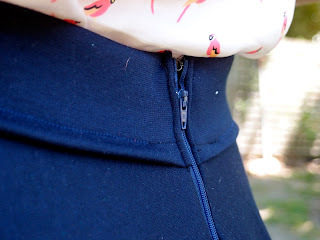 There are plenty of tutorials on how to make a waistband (and I probably do it wrong!) but all I did was fold up some seam allowance on the long edges, and fold it in half. I pinned it so that the folds wouldn't come out. 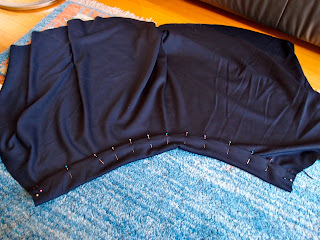 Next pin your skirt into the waistband. 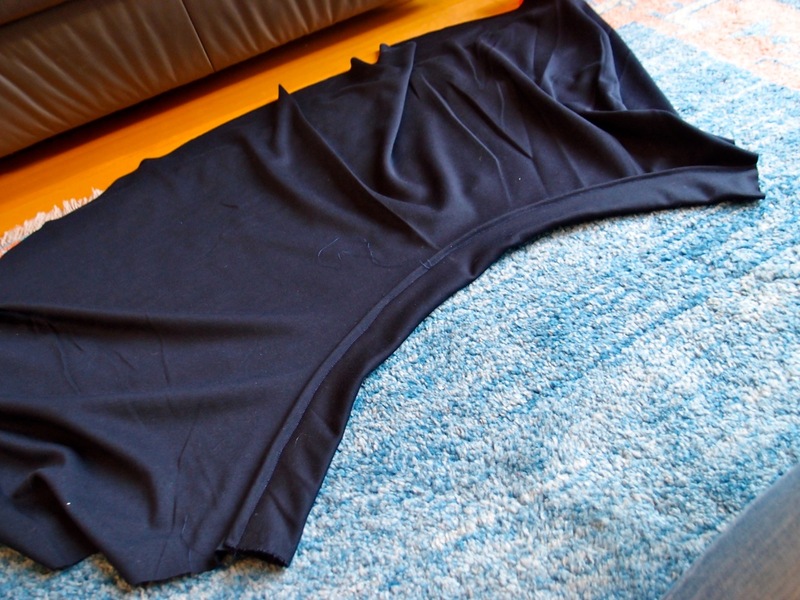 I just put about 1.5cm of skirt fabric inside the waistband. My advice is to pin the ends first, then find the centre and pin that. This is so that you can figure out if anything is too long or short, and stretch it to fit. It's probably best if your waistband is a little smaller than the skirt top. Now topstitch the waistband to enclose the skirt inside. It shoud look like this when done. Now you get to pick which side looks best as it's been made the same on both sides. I had some daggy stitches on one side so it was easy for me to choose! Hot Tip: Stretch the fabric as you sew it, so that it will be stretchy afterwards! Next you get to sew up the side seams. 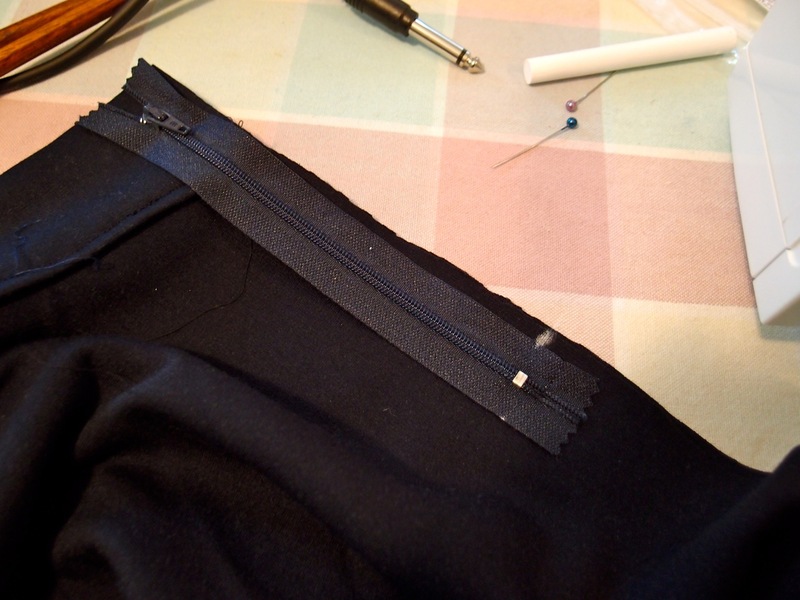 Place your zipper where you want it to go and mark where you want to sew up to. Then go ahead and sew it up! I'd recommend sewing from the top down, so that if the skirt hem is uneven you don't end up with a weird uneven waistband. Sew your zipper in next, in whichever way you choose. I had to hack away some of the inside waistband so that the sewing machine could go over it, but it looks fine on the outside! Just pop in a hook and eye closure on the top of the skirt! Next pop it on and see how much you want to take it up. I took mine up about 1.5cm, as I was after a mid-length skirt. Worn. I paired it with a cute top from Target and a pink ribbon. 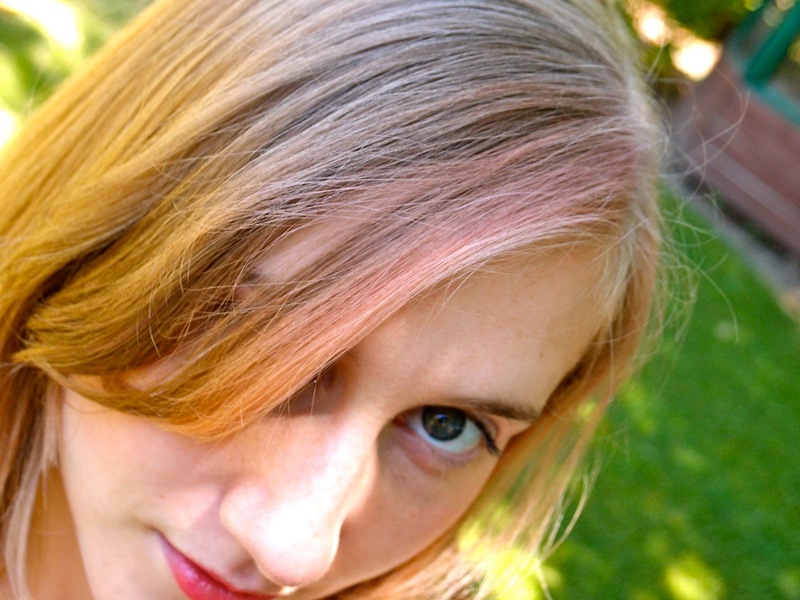 Next time I'll take some more awesome photos that are less dappled and more high-heeled. Yay! Knowing how to make a circle (or half-circle or whatever-quarter circle) is great. I love that you can add them to any dress bodice, too. Glad my navy skirt could inspire your own, and I commend you for adding a zipper -- I was too lazy for that on my own version, and the waistband sure has stretched a lot from pulling it over my hips all the time. Enjoy your skirt! thank you for this tutorial. I would insert elastic into the waistband and sew it up, do you mind if i linked to this tute on my blog? Great tutorial! 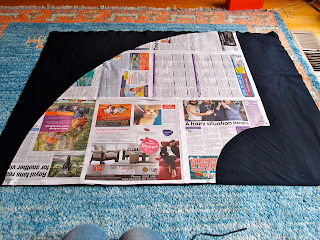 I drew up a half circle skirt pattern ages ago but lost it, this was a great refresher. 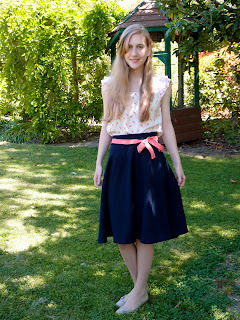 I prefer half circle skirts much more than full circle skirts, less chance of Marilyn Monroe moments! Haha I know what you mean! Half-circle skirts are cute without being over-the-top. Thanks to your blog I have made the cuties skirt for my daughter. She loves it!